Hey, I've been playing guitar for over 5 years yet my thumb/fingers feels like it's had a 2 hour work out after playing the guitar for only 10-20 mins. I've tried the finger strength exercises but my thumb which I use to hold my guitar behind the neck is my weak link, it cracks a lot when I move it from only 5 mins of playing. Any advice on how much pressure/how to hold your guitar properly? Because I'm certain this is the problem. Unfortunately I don't know anyone around my area that plays guitar that can help. David, you mentioned you've tried finger strength exercises, but do you use any finger stretching exercises before playing? Stretching and strengthening are two separate types of exercise, and warming up/stretching should come before everything else. What I usually recommend to students with joint pain that only occurs when playing guitar is to limit your playing to the period of time when there is no pain or other problems. Even if that's only 15 minutes, it's crucial you don't exert yourself to the point where a minor problem becomes an injury. It's also not a productive use of your time to try and practice with unnecessary obstructions, such as pain. So, as soon as you start to feel any joint pain (not aching - that's just your muscles being worked!) put down the guitar and rest for 15 minutes, perhaps have another stretch, or however long it takes for the pain/problem to subside. After a week or so of this routine, you might find you can add on a couple of minutes, or even 5-10 extra minutes before the problem arises. If, however, after 2 weeks of daily practice using the 15 minutes on / 15 minutes break routine there is no improvement, it's time to look at your hand positioning. The reason I would wait until this point to check your hand positioning is because you've been playing for over 5 years, so you've developed your muscle memory to quite an advanced level and changing hand positioning at this stage will not be easy. First, I know it's going right back to basics, and may seem a little patronising now, but go through the lesson on how to hold a guitar. So the palm of my fret hand is almost cupping the back of the neck. There are degrees to which you can do this, so you need to experiment with this to find the position that works for you. 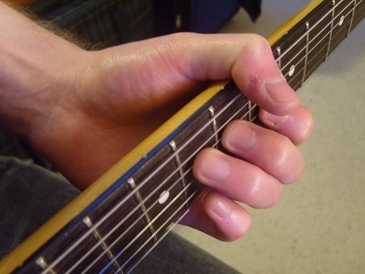 It might look a bit weird if you're used to having your thumb positioned more on the back of the neck, but some guitarists find the above position, although not ideal, relieves a lot of tension in both their wrist and thumb joint. Again, you might struggle with this if you have smaller hands. The only other problem with this position, and the reason I don't recommend it for absolute beginners, is that when you play certain chords (such as barre chords), your thumb will need to quickly move back down to the centre of the neck to support the shape. However, this is how I play it, and eventually your thumb just moves to the appropriate position without thinking about it. It's not the most efficient way of holding the guitar, but it's better than enduring joint pain/problems and being put off guitar altogether. 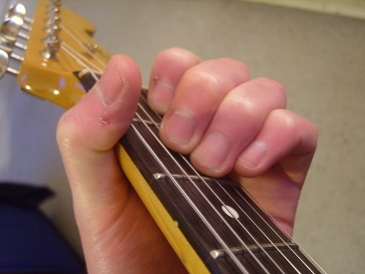 Be prepared to "re-learn" some chord fingerings and changes if you adopt this new positioning. Another way you can help improve your finger endurance is to make sure you drink plenty of water to make sure you're properly hydrated and eat plenty of energy rich, healthy foods (I don't want to sound too much like a doctor here, but it does help). A banana goes a long way. 1) Make sure you spend 5-10 minutes stretching before playing. 2) Practice in 15 minute bursts and rest for 15 minutes in between. 3) If no improvement after two weeks, try changing your thumb position like in the photos above. 4) If still no improvement, let me know using the comments link below and we can go from there! I used to be a bluegrass picker and blues-ragtime player. Years ago I got arthritis in my hands. I was so unhappy I sold all my gear and gave up playing. About 6-7 years later someone gave me an old nylon string guitar. I've since acquired a steel-string and made a solid-body electric out of parts of throwaway guitars. There is no way I can make barre chords and even a simple 1st-position D or F is problematic due to flexibility issues. Heck, I can't even hold a flatpick anymore, it just flies away. What I did was look at what I wanted to play and really thought about how to work around my disability. I don't try to finger all the notes in a chord, just the ones that are necessary. I can fingerpick fine so forget about a pick. I now play blues and old-time ragtime and some jazz. I'm not wonderful enough to go on tour but I enjoy what I do and guitar-playing is actually good for arthritic hands. I recently acquired an old Kay archtop with an impossibly narrow neck for me to fret but I now use it for learning slide on. I am finding a whole new world with open tunings. As an aside, Django Reinhardt is an inspiration. He was the best of his genre in spite of very limited use of his left (fretting) hand. Know your limitations, adapt your playing, find your strengths and uniqueness within those limitations and focus on pushing them to the highest level possible. The limitations soon turn into focus, something many guitarists lack (causing all manner of problems)! Guitarists only tend to see one way of playing their instrument, but in reality you can make music from the guitar in so many ways, whether it be by using different tunings, partial capos or playing it over the lap. Some of those ways you won't explore or even think about unless you are faced with limitations. The person who wrote this e-mail may just need simple resistance exercises to increase hand/finger strength. Our muscles naturally weaken as we age so we don't have the natural endurance of our younger years. I haven't had any problems coming back to guitar because of the various strength building exercises I used to do during my self-defense training days (thumb and two-finger push-ups). After the strength exercises may want to check his posture/hand position.